Kneecap (patellar) dislocations are a fairly common sports-related injury. 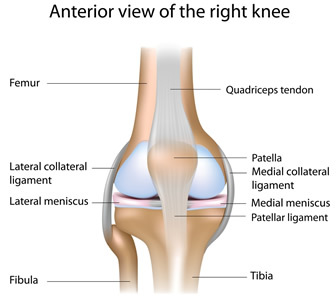 The knee joint contains three bones: the thighbone (femur), shinbone (tibia), and kneecap (patella). The thighbone has a V-shaped notch called the femoral groove that the kneecap fits in. If the groove is too shallow or uneven, the kneecap could slide out. In addition, a sharp blow or unnatural twisting movement could force the kneecap to move out of the groove. This is called a patellar dislocation. Orthopaedic Associates of St. Augustine has a team of fellowship-trained orthopaedic surgeons dedicated to getting patients back to the activities they love. We utilize the latest technologies and practices to not only correct the issue, but to speed healing. If there are no loose bone fragments, your joint specialist will return the kneecap to the correct position by applying gentle force. This is called reduction. Reduction can also happen on its own. Once the kneecap is back in the proper place, you may need a temporary brace. Your doctor might also prescribe some light exercises to strengthen the muscles in your thigh so that the kneecap stays in place. Recovery time usually consists of 7-10 days of immobilization with gradual mobilization afterwards. It generally takes 3-6 weeks for a full recovery. Unfortunately, after a kneecap dislocates, the chances of it becoming dislocated again go up. When kneecap dislocations happen more than once, surgical intervention may be a valid treatment option. Surgery is also necessary when there are loose bone chips in the knee area. Surgery will allow an orthopaedic surgeon to remove any bone fragments as well as help stabilize the kneecap, preventing future dislocations. After surgery, you can expect to return to some activities in as little as 6 weeks, though depending on the type of surgery performed, it can take up to 10-12 weeks. At Orthopaedic Associates of St. Augustine, we’ve assembled the most comprehensive sports medicine team in the St. Augustine and Jacksonville area. With many of our orthopaedic surgeons being athletes themselves, we know firsthand just how important it is to get our patients back in the game as quickly and safely as possible. If you’re suffering from a kneecap dislocation, please request and appointment online or give us a call today at 904-825-0540.